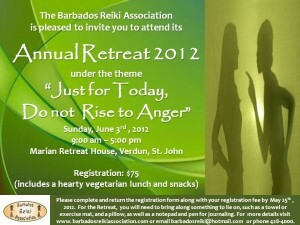 The Board of Management of the Barbados Reiki Association is pleased to invite you to attend the Association’s Annual Retreat, which provides a welcome opportunity each year for Reiki practitioners to engage in introspection, learning and sharing in a serene and refreshing environment. 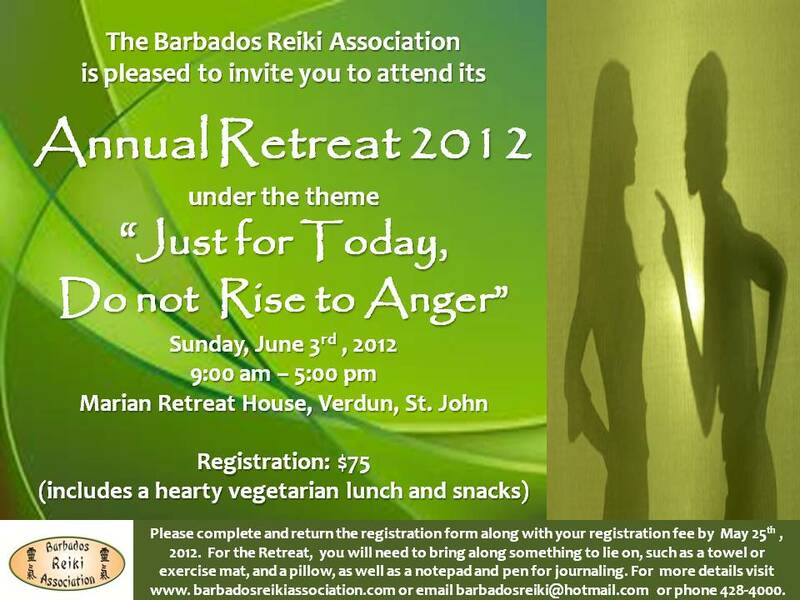 The Retreat takes places on Sunday, June 3rd, 2012 from 9:00 am to 5:00 pm at the Marian Retreat House, Verdun, St. John and is open to all Reiki practitioners. This year, the day will be dedicated to the second precept, “Just for Today, Do Not Rise to Anger”. Participants will examine the effects of anger on themselves and others and their own anger triggers, as well as learn communication and release skills to better manage anger. The Retreat programme is included here for your perusal. Also included is the registration form, which you should complete and return as soon as possible. We ask that you also make arrangements at the same time to pay the registration fee of $75 in accordance with the instructions provided on the form. Please feel free to share this information with other Reiki practitioners. We look forward to participating with you in this exciting and highly benificial event!